The Gold first appeared in Harper's Monthly Magazine (December, 1904). The Colonies had but recently declared war with the old country, and Abraham Duke being an able-bodied man, although no longer young, was going to fight for the cause. He was fastening on his old sword, which his father before him had wielded well, and his wife Catherine was standing watching him, with an angry cant to her head. “Wherefore cannot you tell me where the gold is, Abraham Duke?” said she. Abraham Duke regarded his wife with stern melancholy, and his glance of fixedness in his own purpose was more impregnable than any fort. “I have given you all that I could, Catherine,” returned Abraham, gravely. “There is no need for a woman of industry to starve in a good home, with a bound boy to cut wood and dig the garden for her, and cows and sheep and chickens,” said Abraham. “But should the enemy come and take them all, as they may do, since we are on the seashore!” cried Catherine. “Father! father!” gasped the boy, and then he hung almost lifeless on Catherine's arm. “What ails your father? Speak!” cried Catherine. “Father is killed,” replied the boy, faintly. But when Catherine turned to look at her husband there was no one there, and she for the moment thought nothing of it, inferring that at the child's first word he had hastened to see what had happened to his friend. But Abraham Duke did not return, and it was known on good authority that he had never set foot in Joseph Evarts's house to ascertain what had happened to him, but had made his way straight out of the village to the army, the company of which he was a member being assembled in Suffield, about ten miles away. Catherine, although she had had the difference with her husband concerning the hiding of the gold, felt hurt that he should have slipped away in such wise without a word of farewell while she was in such anxiety over the bereft child, but she had no suspicions then, or afterward, and nobody spoke of suspicions to her. But suspicions there were, although they slumbered in the general excitement of the war and the ever-recurring rumors of a ship of the enemy in sight and about to land in the harbor of the little village of South Suffield. It was said that Abraham Duke was the last one seen entering and leaving the house of Joseph Evarts the evening before his dead body was found by his little son, who was returning from a visit to his grandmother; his mother was dead. Little Harry Evarts had, indeed, found the door of his home blocked by something, and pushed with all his childish strength, and found, when the door yielded a gap, that it was the body of his father, dead of a sword-thrust in the side, which blocked the door. Evarts had been a goldsmith by trade in the old country; since he had been in the new, finding little opportunity for the exercise of his craft, he had supported himself and his little son by working his farm. It was held that Abraham Duke had gone the night before to bid him farewell. Mistress Prudence Dexter, who lived next door, had distinctly seen him enter and leave, and she had seen no one else that evening, and it was bright moonlight and she had been sitting beside her window with no light, to save candles. Still, in spite of the sinister report, Abraham Duke's standing — he was tithingman in the meeting house, and esteemed by all — and the utter absence of any known motive served to keep the suspicion well within bounds, and would have done so even had not everybody's mind been distracted by the war and the rumors of strange sails on the horizon. Meantime Catherine Duke lived on alone, save for the bound boy, who was none too bright as to his wits, although strong and a good worker, and night and day she searched for the gold, which she was confident her husband had hidden somewhere about the house, if he had not buried it in the field. Her husband had not been gone twenty-four hours before all the usual hiding places of treasure were overhauled, such as old teapots, the drawers of dressers, secret drawers, and the clock. She searched the clock particularly, since she heard that her husband had been seen coming from Joseph Evarts's with some of the works of the clock that night before he went away. Prudence Dexter had averred that she had distinctly seen the dangling pendulum of a clock from under Abraham's cloak as he went down the street. Catherine, knowing that the dead man, Joseph Evarts, had been a cunning workman in many ways, thought that he might have rigged for his friend a secret closet in the clock, and she searched it well, but found nothing. She thought that it might have been possible for her husband to carry the main body of the clock under his cloak, for the purpose of the secret closet, but, although she sounded every inch and poked the inmost recesses of the clock well over, no gold did she discover. She therefore let it be, ticking with the solemn majesty of its kind; it was an eight-day clock, taller than a man, standing like Time itself in the corner of the living room, and casting a shadow like the shadow of a man across the floor every morning when the sun shone into the room. But she searched, after she had searched the clock, every inch of the house. She even had the hearthstones taken up, she and the dull-witted bound boy, working by candlelight, with the curtains drawn, that the neighbors might suspect nothing, and she replaced them in a masterly fashion; for Catherine Duke was in reality a masterly woman. And then she had out many of the chimney bricks, as many as she dared, and she even had up some of the flooring, but she found nothing. Then she and the bound boy dug up the cellar bottom, and then the bound boy ploughed every inch of land which had hitherto remained uncultivated. She could do that openly, and people began to say that Catherine would make more of the farm than her husband had done. But the land that was too stony for the plough she was more secret about, she and the boy digging it up by moonlight and replacing the sods. Once she ventured forth with a lantern in her impatience, but the light, seen flitting along the field near the shore, occasioned a rumor in the village that a ship of the British had landed and a drum beat to arms. Then all the old men and boys left in the place sallied forth, and Catherine and the bound boy, whose name, which belied his character, was Solomon — last name he had none at all that anybody knew, for he was a foundling — had hard work to reach the house undiscovered, although she blew out the lantern and scudded for her life with her petticoats lifted, while the boy sped with her, the more afraid that he knew not what he feared. However, all Catherine's searching came to nothing, although she worked hard — and hard work it was, with what she had to do on the farm. No woman in South Suffield was considered a better housewife than she, and she had to live up to her reputation. She and the boy sheared and washed sheep, and she spun and wove the wool. She tended the flax and made of that lengths of linen cloth; she made her soap and her candles, and kept her house as neat as wax, and all the while the search for the hidden gold was in her mind. Many a time in the dead of night would she, lying awake and pondering over it, and striving to place her own mind in the attitude of her husband's when he had hidden the treasure, think of another place where she had not looked, and be up, with her candle lit, and over the house, in her bedgown, to find nothing at all. Catherine grew old with the loneliness and the ever-increasing wrath with her husband, who had so mistreated her after her years of self-denial and toil for his sake. The sense of injury is like a fermenting canker in the mind when once it is allowed to work with no protest. Catherine's pretty, round face grew long and sour, her smooth forehead knitted. Her blue eyes got an expression of sharp peering which never left them. She even looked at her friends as if she suspected that the hiding place of the gold might be in their minds. And yet all the time she had in reality no desire for the gold itself, for she had enough and to spare. Had she found the gold she would directly have hid it again and spent not one shilling until her husband's return, but the sense of injury ever spurred her on with a goading which almost produced madness. She asked herself over and over why she should not know — why her husband, for whom she had saved and toiled, could not have trusted her? Of a Sabbath day, when she went to meeting, she regarded the parson, Ebenezer Rawson, with a covert hatred, since he held the sealed letter, and had been trusted to a greater extent than she. 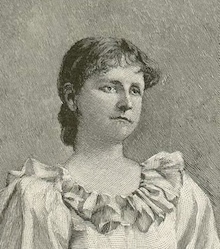 Sometimes, although in spite of her wrath and sense of ill treatment, which warped her mind, she still loved her husband and prayed for his safety, the imagination would come to her how, in the case of his falling before the enemy, she should go to the parson and demand the sealed letter, and know at last what she had a right to know — the hiding place of the gold. After her husband had been away some six months and she had had one letter from him, with not a word about the gold, she dressed herself in her best — in her red cloak, which she had had as a bride and kept carefully, and a hat with a plume which would have become her had she not gotten the expression on her fair face of the seeker after dross, which disfigures more than aught in the world — and she made her way to the parson's house. He was a widower, and always had a kindly word for a pretty woman, although esteemed, as her husband had said, a man who kept his own counsel. Past the parson's housekeeper, an ancient aunt of his, declaring that she had need of spiritual consolation, and leaving her staring, suspicious because of the red cloak and the plume, she marched into the study, lined with books which damned all mankind by reason of the love of God, according to the tenets of the day, and she found the parson at his desk, with his forehead knitted over the tenthly of his next Sabbath day's sermon. And then calling to her aid old blandishments of hers, she beset the parson for the letter, although the conditions of its delivery were not fulfilled, and she gave good and sufficient reasons why she should know the secret, since lately the rumors of the enemy on the coast had increased, and she argued that she should know the hiding place of the treasure, that she might bury it safely away from the greed of the redcoats. But Parson Ebenezer Rawson, who was a handsome man in a powdered wig, and had something of the diplomat in him, only laughed, and spoke to her with a pleasant chiding, the while he noted that she was no longer, in spite of her red cloak and her feather, as goodly to see as she had been, and had an apposite verse of Scripture concerning the frailty of the flesh and the evanescence of beauty enter his mind. Catherine blushed high with anger. “But I am in want of goods for household use,” said she. In response to that, Parson Rawson surveyed her rounded form and the sumptuous folds of her red cloak, and said that he could not betray his trust, since his word, once given, was like a lock and seal upon his soul, and that did she want for the necessaries of life he would advance the money needful to her upon a loan. At last Catherine Duke went away, still unsatisfied, and she walked — for thoroughly feminine she was — with a graceful movement, being conscious of the carriage of her head and the folds of her red cloak, until she was out of view of the parson's windows, and then she broke into an angry switch, and she even wept like a crossed child, as she went along where there were no houses. Solomon started, although he was afraid — for he was more afraid of his mistress' anger than of any unknown quantity — but she called him back. “If you see no one on the road,” said she, “keep on until you reach the Evarts house, and look and see if you spy a light in the east chamber.” Solomon sped away, although his legs trembled under him, for the fear in his mistress' heart infected his own. Catherine went into the house and hung on the porridge kettle, and very soon Solomon came back, saying that he had seen no one, and there was no light in the east chamber of the Evarts house, but there was a boat moored behind the house, on the seashore. “Nay, mistress, 'twas a boat,” persisted the boy; but when Catherine insisted that he had seen wrongly, he yielded and agreed with her, and said it was the wreck, for he had no mind of his own when the pressure of another was brought to bear upon it. But the poor lad was right, and it had been well for poor Catherine Duke had she heeded him and taken the candle gleam in the chamber of the deserted house and the boat on the sand behind it as a warning, instead of recovering her bravery of outlook and going about her evening tasks as usual. After supper she set Solomon to paring apples to dry, and she herself spun at her flax wheel. They found her hard by it the next day, and she was murdered even as Joseph Evarts had been; but she had not come to her death so easily, for she had been tortured first, and there were the marks of fire on her feet and hands. As for the bound boy, he had leaped out of the window as the men beat down the door, and he had sped away on his long legs, with what little wit he had ever owned wellnigh gone forever. When he was found and brought back, he shook like one with palsy, and he went through his life so, and he could speak only in disjointed stammers. As for answering questions to any purpose, there was no hope of it from him, although the people gathered some confirmation of what they at first suspected, that Catherine had been first tortured to make her reveal the hiding place of her gold, and then, when she did not reveal it, as she could not, poor soul, she was finished. Then the whole house had been ransacked for the gold, but the robbers and murderers found it no more than Catherine had done, although people were not sure of it. Indeed, it was said by many that the men, who were supposed to have come ashore in the boat which had been moored behind the Evarts house, and which had been seen by a man passing as well as by Solomon, had found the gold and taken it away. Catherine had talked much, to her own hurt, about the treasure, and there were stragglers from the army, as well as the enemy, to fear. Some said they were British soldiers who had come ashore in the boat, and some said they were men from the Colonial army, a company of which had been recently stationed for a short time at Suffield, but no one ever knew certainly. When Abraham Duke came home, with only one arm, having lost the other by a British shot, he found a deserted home and a devastated farm, for there had been a raid by the enemy after Catherine's death. They had left the house standing, with its contents, but the livestock had been taken. Abraham lived on alone, and worked his poor fields painfully, being so crippled with only one sound arm and hand, and he barely kept soul and body together, for, if the gold had not been stolen, he made no use of it. Sometimes the neighbors, albeit grudgingly and doubtfully, being still uncertain as to whether he was hoarding his treasure or not, came and helped the poor man with his scanty harvesting. However, they seemed to meet with but little gratitude, for Abraham Duke, always taciturn and cold of bearing, had become more so. He spoke to no man unless he was first spoken to, and then he made scant reply. And although he still attended all the services on the Sabbath day in the meeting house, he had given up his office of tithingman, and would not have it; and people said he had doctrinal doubts, because of his afflictions, which were not to his credit, even if he was innocent of the crime which those who were more ready to think evil laid at his door. As time went on, people looked more and more askance at him, for his face grew more and more bitter and forbidding, even terrifying. The children became afraid of him, and gradually the old suspicion became more assured. He was held (although no one had any proof, and, there being no motive for the crime, there was no talk of bringing him to justice) as a man accursed, and when he was helped it was more and more grudgingly and with serious doubts as to the blessings to be received for the deed. Joseph Evarts's son had grown up, and he was living in his father's old house with his grandmother, who still lived, although very old, and never did Abraham Duke pass the house that he was not conscious of the young man's eyes upon him. Abraham had become aware of the suspicion, and it looked more keenly from Harry Evarts's eyes than any other's. Abraham rarely looked the young man in the face, for it had become to him the face of an avenging fate. He went past the house with his head bent, but always he knew there was an eye upon him — if not the young man's, his grandmother's, for she too suspected, and voiced her suspicions openly. Her old face, set in the narrow window frame, was as malignant as a witch's upon Abraham Duke passing by, and he felt it, although he did not look up. Affairs grew worse and worse with him. Rheumatism beset him one winter, and he was crippled with that, as well as his maimed arm and his age, for he was now an old man. He sat all day by his fireless hearth; for it was often fireless, since he could not cut wood nor hire it cut, and often he went a day without food, for he was more and more abhorred for the shadow of suspicion of an evil deed which had fallen upon him. Old Parson Rawson had died years before. He had given up the sealed letter to Abraham when he returned from the army, and Abraham had taken it without a word, and nobody knew what had become of it. Abraham Duke lived on, hanging to life with a feeble clutch, like an old leaf to an autumn bough, and he was near eighty, and suffering all that one could suffer and live. He was slowly freezing and starving to death, and the occasional aid from his kind only served to prolong his misery. At last, when he was eighty, there came a fierce winter, and one morning Harry Evarts, who had lately married, and whose heart, embittered with suspicion and the desire for vengeance, was somewhat softened by the thankfulness for love, thought of the old man, and, walking down the turn of the road, and seeing no smoke from the chimney, he returned home for his hand sled, and drew a good store of firewood, with a basket of provisions, to the Duke house. It was a bright, freezing morning, a day glittering as if strung with diamonds, and the wind from the north was like a flail of death. Harry Evarts shuddered as he dragged his sled up to the door of the Duke house, and he hesitated a second for dread of what he might find when he entered. Then he heard a sweet voice from behind calling, and the girl he had married came running to join him, her fair face all glowing with the cold. Harry shut his mouth hard and pounded again, and again came the echo like a voice of desolate mockery from the outside of life. Then Harry shut his mouth harder, and opened the door, which was unlocked, as if the old man had left it on the latch for death, and he entered, Elizabeth shrinking behind him. Harry did not stir. He was thinking of his father, and how he had come home to find him lying dead across the door. “Harry,” said the girl again, “there is a letter.” Then she reached down and softly took the letter from the dead man's hand, which seemed to yield it up willingly. “Harry, the letter is for you!” cried Elizabeth, in an awed whisper. Then she handed the letter to her husband. “Open it,” said she. “I can't,” said the young man, hoarsely, for he was fighting a fight with himself. “My father did the work; he made the things of gold instead of brass, and he knew!” exclaimed Harry. Add The Gold to your own personal library.